Projection Master is a unique feature of ZBrush that allows you to use all of the 2D and 2.5D brushes in sculpting, texturing, and otherwise working with your 3D model. The concept behind Projection Master is simple. While working with a 3D model (usually a very high-resolution one–the more “standard” 3D tools are usually used when sculpting low- and medium-resolution details), you activate Projection Master to convert the visible portion of your model into pixols on the canvas. This simply samples the depth of your model at each visible point on the screen, and adjusts each corresponding pixol to reflect the depth, color, material, etc., of the model at that point. The model is then temporarily removed from the canvas, leaving you to work with the pixol-based representation of the model. This process is referred to as dropping the model to the screen. Once you’ve done your painting, sculpting, and so on, you then use Projection Master to “pick up” the model. This maps the altered pixols back to the original model, and in the process transfers the changes in depth, color, etc. Being able to use any paintbrush to affect the final geometry of the model opens up a huge number of possibilities. For example, you could use the Blur brush with Rgb turned off to smooth out a section of the model that is too rough. Projection Master is normally used by dropping the model, working on the parts of it most directly facing you, picking it up and rotating it a small amount and then dropping it again, and so on. This allows you to transfer the maximum amount of details between the model and the canvas pixols. Note: Projection Master is a major enhancement to 3D Copy functionality, which it replaces for almost all uses. 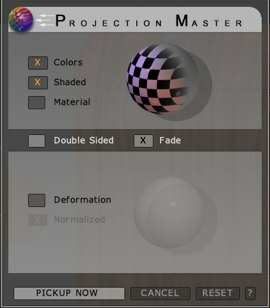 Projection Master is invoked either by pressing the Projection Master button (located in the default configuration near the top left corner of the ZBrush window), or by pressing the ‘g’ key. Once you’ve finished your painting, doing the same thing will take you out of Projection Master. Projection Master requires that a texture map be assigned to any model you use it with. If you don’t preassign a texture map to your model, you’ll be prompted as to whether or not you want one to be created automatically. The Projection Master dialog appears when a model is dropped, and again when the model is picked up. It provides various options that control both what is transferred back and forth between the model and the canvas (for example, you can choose to have your work on the canvas affect the model’s geometry but not its color), and also provides options as to how some of those properties are transferred. The two spheres in the Projection Master dialog give visual feedback as to how the options you’ve selected will affect the transfer of details from and to your model. Projection Master also comes with extensive online help that illustrates all of the details of its options; just press the ? button in the lower right corner of the Projection Master dialog. In general, you will get the best results with Projection Master when, before “dropping” your model, you scale it first so that the area of a visible polygon is approximately equal to the area of a pixol on the canvas. If polygon are much larger than pixols (say a polygon occupies an area of 100 pixols), then your finest details may not transfer back to the model, as for example details in that 100 pixol area cannot be transferred back to the model; Projection Master does not create new polygons, so any geometry in that 100 pixol area will simply be “transferred” back to a single polygon that remains flat. On the other hand, if your model is such that many polygons cover a single pixol, the situation is the inverse of the above situation; since you can only paint a single pixol, any details you create on that pixol will be transferred to all the polygons under it, more or less uniformly. So, when you go from your model to Projection Master and back, you may lose existing detail on your model. Aside from the simple, obvious controls, most of the options in the Projection Master dialog have to do when one is painting or detailing near the edge of a model, or on a portion of a model where the normal of the plane at at that point is pointing far away from you. For many reasons, the best way to use Projection Master is to rotate your model so the area of interest is facing you, drop it and paint and detail that area, and then pick the model up, rotate it to the next area of interest, drop it, and so on. If you work this way, you’ll find that many of the options described below are usually unimportant to you. This really doesn’t require much explanation. When it is on, then any colors painted on the canvas when Projection Master is active will be transferred back to the texture map of the model, when the model is picked up. This is similar to the Colors option. In ZBrush, models can have a single default material, but they can also have a ‘material map’ as well as a texture map. When the Materials option is on and a model is dropped, then any material painted on the canvas will be transferred to the object’s materials map when the model is picked up. 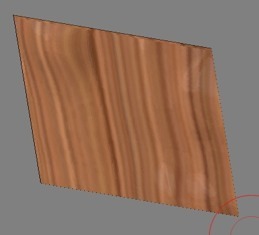 Some materials take a model’s texture into account, and some do not. So, for example, when painting a model with both color and material, the material may completely block any, or the texture may show through in some way. The figure below shows the same model from two slightly different views, after material and color were painted on it, one material in each corner. In all cases, the brush color was red. 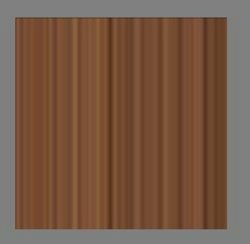 The reflective material and woody material did not let the background texture (color) through, the other materials did. Also note that the materials change appearance when the model is rotated. Aside from the reflective material (which is simply reflecting an environment map), this is because ZBrush materials are computed at each point based on the location of that point; so when something rotates or moves, the locations of its points change, and the material appearance at each point also changes. The Fade option affects how color is applied when texturing a model, or how deformations are smoothed in parts of a model. When Fade is turned off and texture or color is painted onto the model, that texture or color is applied equally to all visible parts of the model; if using a pure color, this means that when the model is picked up, all areas of the model that were painted will have a single, uniform application of that color. If Fade is turned on, then that color will be faded depending on the angle the surface of the model makes with the screen normal. It is as if you are painting by spraying with an airbrush directly into the screen. Areas of the model that are oriented away from the screen normal will get less paint than areas oriented toward the screen normal. 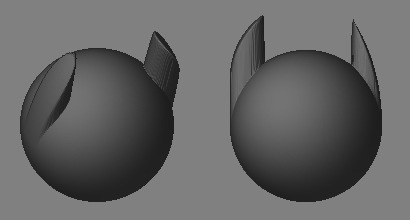 The model shown below was textured with the following process. The model was created, and oriented so that the bump in the center pointed directly at the user. The model was dropped, with Color and Fade activated in Projection Master, and all other options turned off. The SimpleBrush was made large enough to cover the entire model at one time, and red was picked as the foreground color. As is clearly visible, the red texture was faded (applied with a lower intensity) in areas of the model that were oriented away from the screen normal. As a result, the white background shows through. More generally, Fade will cause pre-existing texture to ‘show through’ new texturing in differing degrees, depending on the orientation of the model’s surface. The Fade setting also affects sculpting done in Projection Master. This is unlikely to be visible in the fine detailing for which Projection Master is typically used, but can certainly be seen in larger deformations, such as those shown below. In the figure below, two identical deformations were applied to each sphere (in a manner similar to that described in #Normalize), but one was applied with Fade checked, and the other one with it unchecked. The rotated view in the left part of the figure is simply to show the overall shape of the deformations. It’s the orthographic view on the right where the differences can easily be seen. In that view, the “ear” extruded with fade on is on the right side of the sphere, and the ear extruded with fade off is on the left side of the sphere. 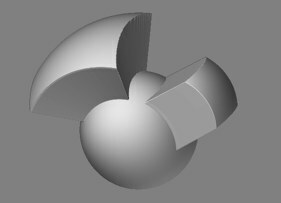 The faded extrusion merges smoothly into the sphere, while the unfaded extrusion was simply pulled straight up from the sphere, resulting in an ‘interruption’ of the curvature of the model. The setting of this value will depend on what sort of detail you are sculpting. Bolts will probably be pulled out of a surface with fade off, while organic details should have fade on. But in detailing the differences may be so small that you won’t really care. When this option is checked, changes you make in the depths of pixols while in Projection Master are transferred back to affect the polygon positions of the model when the model is picked up. Aside from understanding the section Pixol to Polygon Ratio, there’s not much more to say about this option. This is the option within Projection Master that allows ZBrush to sculpt incredibly fine details on high-poly-count models. If you’re doing that sort of detailing, you’ll almost always leave this option on. The sphere was dropped to the canvas. Alpha Brush 00 (hard-edged square) and the Simple Brush tool were selected. Focal Shift was set to its minimum value to ensure a hard edge on the extruded square. Z Intensity was set to a fairly high value, and ZAdd was turned on. Together, all of the settings meant that a click of the mouse button would cause a hard-edged square under the mouse button to be moved towards the user by a noticeable amount. To actually make the extrusion, the mouse was placed over the center of the sphere (as it had been dropped), and clicked several times. Each click brought the circular area of the canvas around the cursor closer to the screen. Finally, the model was picked up. After both extrusions were created, the model was rotated to make the extrusions more visible, and the screenshot was taken. Note: While in Projection Master, there was no visible difference in the two different sculpts. The normalize effect is applied only when the model is picked up, and does not show up before that point. It’s easy to see what happened in each case. With normalize on, the sides of the extrusion were projected up from the surface of the sphere, while with normalize off, they were projected along the z-axis of the global coordinate space. When doing fine detailing, on a surface that is more or less facing you, it’s best to leave Normalize off. The reason is fairly simple. If, for example, you are doing additional detailing on an area of skin that has already had some scars sculpted into it, then while the skin area as a whole might be facing you, the edges of the scars will be facing in many directions. Using Projection Master to add more details on top of the scars, with normalize on, may result in some of that detailing being pushed “sideways” into parts of the scars, depending on the orientation of the scar surface. When the scar surface changes orientation rapidly over a small distance, this may result in some odd visuals. In extreme cases, you might also get surface interpenetration. 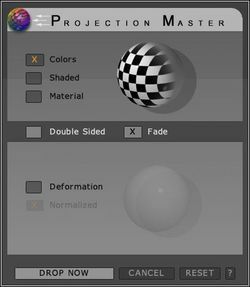 The Shade option in Projection Master is used to bake shading (shadows, light color, reflectivity, etc.) into textures produced by Projection Master. 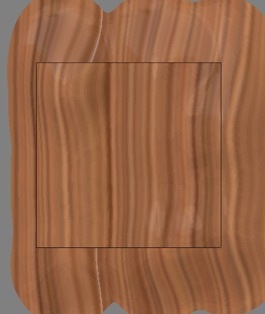 Normally, only painting done on the model is transferred to the texture map. Again, an example is the best way to make this clear. 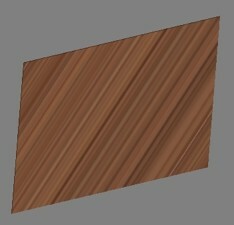 The resulting texture (produced when the model was picked up, with Shade on) applied to a simple square plane. As you can see, the shading that was visible after the model was dropped and a best render done has been painted onto the texture map. Had Shade been unchecked, the resulting texture would have been pure white (assuming we began with a white texture), since we didn’t paint the dropped model at all. The shading option causes any shading visual effects to be incorporated into the texture map. For example, if we dropped the model with Transform:Draw Polyframe on, then the grid shown on the model’s surface as a result of that display mode would be a part of the final texture map. 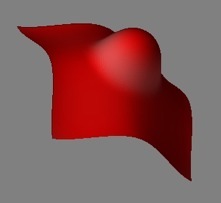 You can use this feature to produce such things as maps that enhance the darkness of cavities on a surface, to bake shadows onto a surface and so eliminate the need for shadow generation in future renders (assuming that changes in the scene don’t cause the shadows to change), and other specialized applications. Perhaps the most common use Shade option is to bake surface shading produced with the use of Materials into textures, for export into other programs. As we saw previously, we can paint materials onto the surface of a model. However, since materials are nonstandard across 3D applications, there is no way of including this material information when the model is exported. By baking the material into the texture using Shade, we can get a material surface effect that can then be used with external models. Plane drawn with GradientMap material, front ortho view. Materials change as the positions of points they are appied to change. When creating materials, this can be a simple and useful way to alter the look of the material. Once the desired effect has been achieved, baking will freeze the look of the material (by creating a texture) so that the model’s surface appearance does not change as the model is rotated, positioned, etc. This ensures that a “material map” will not be created for the model; however, the underlying pixols will still receive the GradientMap material we’ve selected as the default material for the model. Mrgb, Rgb, and M were all of (so neither color nor material would be painted). Zadd was on, Z Intensity was set to a moderately low value, Draw Size was about 100, and Focal Shift was set to its lowest value. I also selected the Brush 01 alpha, and the Freehand stroke. Together, these settings ensured that strokes would give smooth depth displacements in small amounts. I turned off all but the main light, and positioned that so it shone directly from the viewing position. (See the Light Palette.) This effectively eliminated shadows that would otherwise have appeared. The texture can now be exported and used in other programs. Note: Many effects can also be produced with the various settings that are available for each material, and you can create your own new materials as well. See the Materials section. This is a good way to produce smooth, nonreflective surfaces, such as wood grain, stone or brick coloration, and so forth. It can also be useful for producing backgrounds. It won’t work so well for rough or reflective. surfaces, since the texture produced for those surfaces cannot react to changes in lighting.